It is getting closer. Halloween night is almost upon us. A night of ghosts, goblins and scary tricks or treats. Today, here around the corral, lots of schools and churches are doing their “Fall Festivals” tonight, so I decided on something fitting into those festivities for today’s scary treat. Straight from the high school gym and Mr. King’s slightly askew mind. 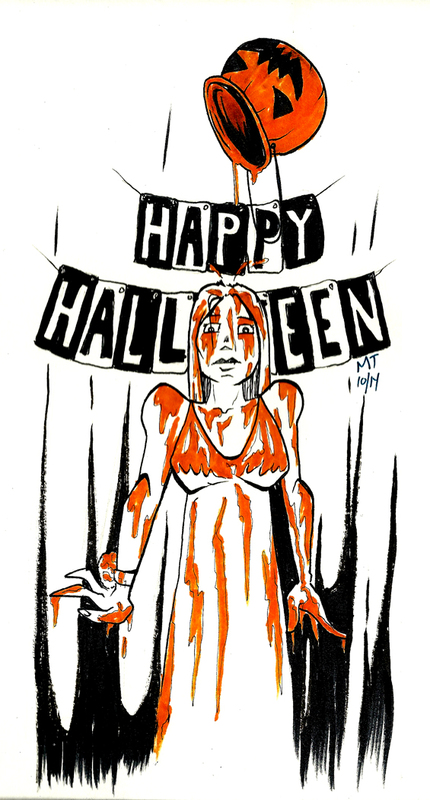 Ms. Carrie White from the novel (and movies) Carrie. “This wasn’t funny at the last dance either.” Carrie said as the flames started licking up the walls of the gym. This entry was posted in 13 Days of Halloween, Commisssions, Halloween, Movie Monsters, Movies N Films, Retro Sketch. Bookmark the permalink.